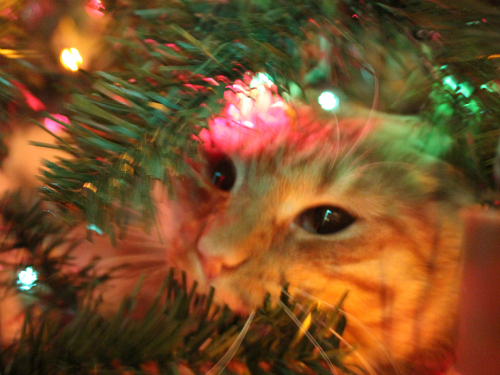 love, laurie: oh, christmas tree. i am definitely not one of those people who starts to get all geared up for christmas before thanksgiving even rolls around. i like my holidays separate, not all crammed together. i like them to be able to breathe a little before we go rushing on to the next holiday. so, after thanksgiving i like to finish off all of the leftovers before i even consider digging the christmas decorations out of the basement. now that thanksgiving is officially behind us (and the leftovers have been demolished) i think i'm ready to get started on the next holiday. earlier this week ryan and i pulled our trusty christmas tree out of it's hibernation in the basement and dragged it up to the living room. 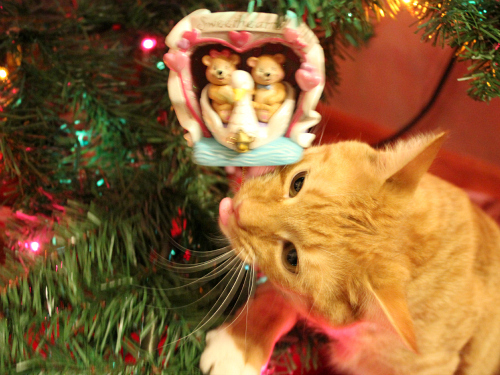 after assembling it and giving it a good dusting off, we decorated it with our ornaments. 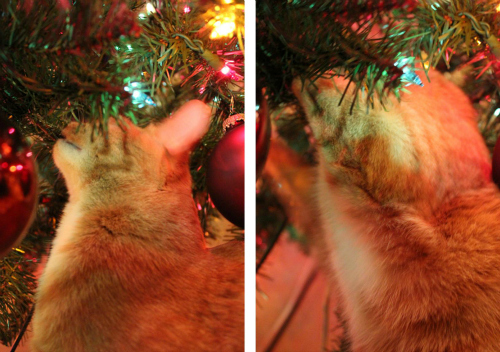 we weren't too sure how leko would react to the christmas tree since it has been a whole year since he has seen it last, but as we predicted, he quickly rediscovered his love for climbing the tree. the poor tree. i feel so sorry for it. it is 6.5 feet tall, but it sure is skinny and scrawny, and it can barely support the weight of our 12 pound furry baby as he shimmies his way up the trunk of the tree each day. it's sad to watch the branches bow under his body weight. needless to say, i made sure to secure the ornaments on the tree very tightly this year, wrapping the ornament hooks around the branches numerous times. however, between the shaking of the tree and the batting at the ornaments, i 'm not sure if our tree and our ornaments even stand a fighting chance this year. for some reason our christmas tree skirt can't seem to stay in place around the base of the tree either. let's just blame it on the wind . . . a blur of orange furry wind, that is. we hung our stockings on the back of our front door (that's what you do when you don't have a traditional fireplace or a staircase banister, right?) and we put all of our christmas decorations around the house too. of course, we had a helper when we tried to put the christmas table cloth on the dining room table, and we have saved the dining room table centerpieces from several close calls already too many times this week. our next task is to hang the christmas lights outside. i'm pretty sure when we are ready to put up the lights, we will have a helper directing us from inside the window as to where we should put each strand of lights. we sure do love our silly little kitten! What a cute little naughty kitten. 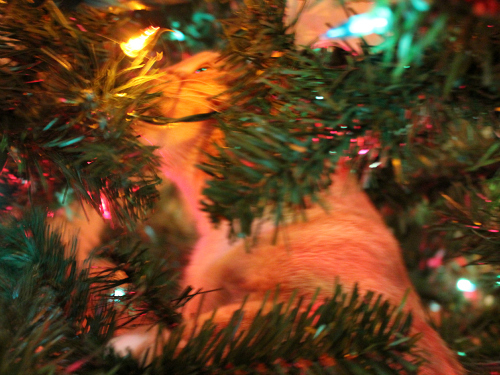 I absolutely love the picture of him peeking between the branches with the lights shining on him. I would love a copy of it. Please email that one to me. That is a beautiful shot. Would be good for a Christmas Card. 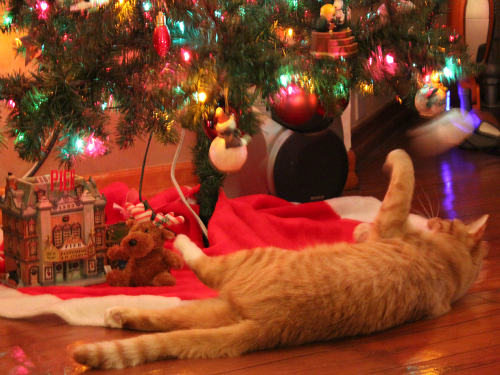 I'm sure Leko thought you put up the Christmas tree just for his amusement! Such a cutie! Oh my gosh how adorable is your cat?! haha I love it! 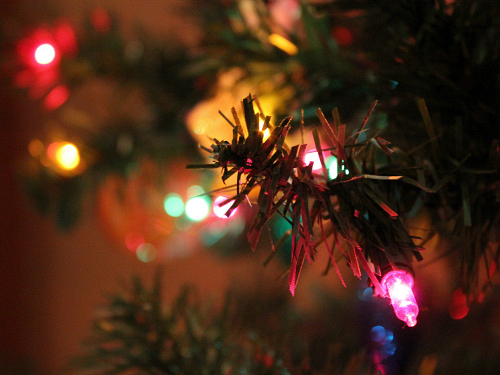 I also wish we had a Christmas tree up, this post made me want on haha love the lights :)!